Has summer hit where you live? We officially call it HOT here in the valley when the temperature is 90 degrees and above. Today has been a beautiful day 92 degrees and it’s HOT! It will be even warmer tomorrow – perfect timing for Chilled Green Pea Soup! I’m excited to share this recipe with you because it is perfect for spring & summer! If you’re hosting a baby shower or lovely brunch – you can WOW your friends and family. I made this for my Mom on Mother’s Day. It is so bright and flavorful! 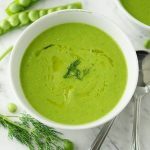 Chilled Pea Soup is a burst of springtime flavor! Before I share how easy this soup is to make, I want you to pause for a moment. Think spring with mountains of wildflowers and bright blue skies because this soup has the brightest flavor! Super healthy with fresh vegetables given a quick sauté and paired with amazing herbs and spices. 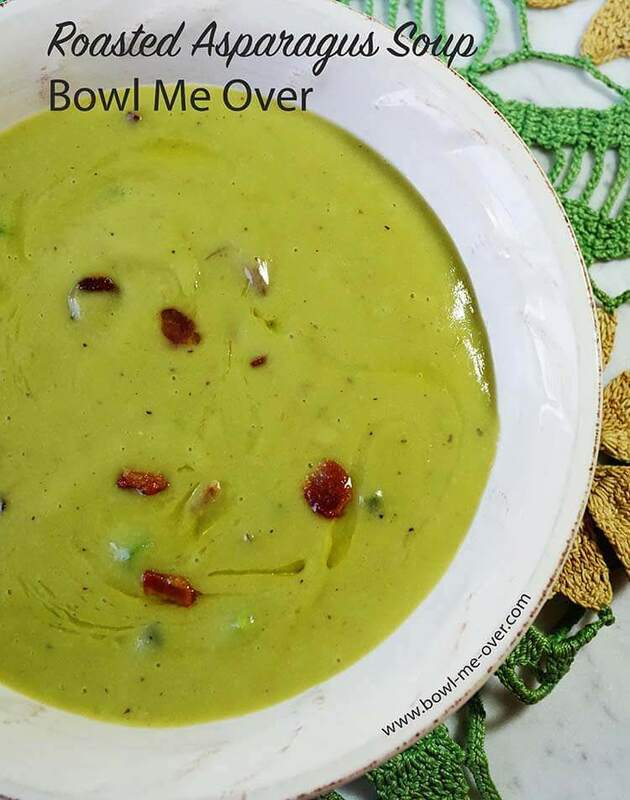 If this Chilled Green Pea Soup doesn’t scream spring, then I don’t know what does! So let’s try this again. We are going to use frozen peas but shhh…. no one needs to know! Believe it or not, this beautiful soup only takes 15 minutes to make and it’s served chilled, though you could just as easily warm it up. 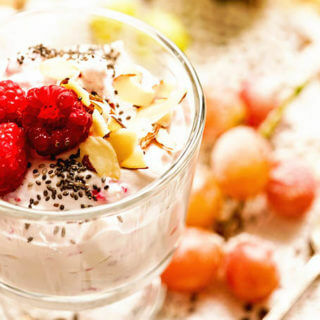 Delicious flavor that you wouldn’t dream comes from a chilled soup! This would be perfect for Brunch, Bridal or a Baby Shower, Tea or Birthday party. 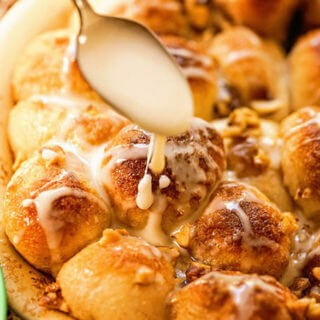 Simple and delicious it uses just a handful of ingredients! Let me show you how easy this is! Chop an onion and sauté it with minced thyme for about five minutes. Add minced garlic and sauté for another minute or so. Next add this mixture to the blender. Add one 10 oz. package of frozen peas and two cups of stock (I used chicken, but you can just as easily use vegetable stock and it would be vegan). Blend until smooth and chill – it’s that easy! 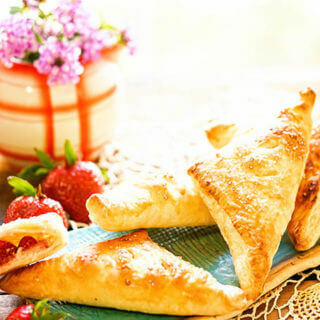 It can also be made ahead and will store for up to two days in the refrigerator. Just give it another whirl in the blender before serving. Garnish with a handful of fresh peas, chopped fresh dill or crispy fried onions! Garnish with a drizzle of good olive oil and fresh chopped dill. 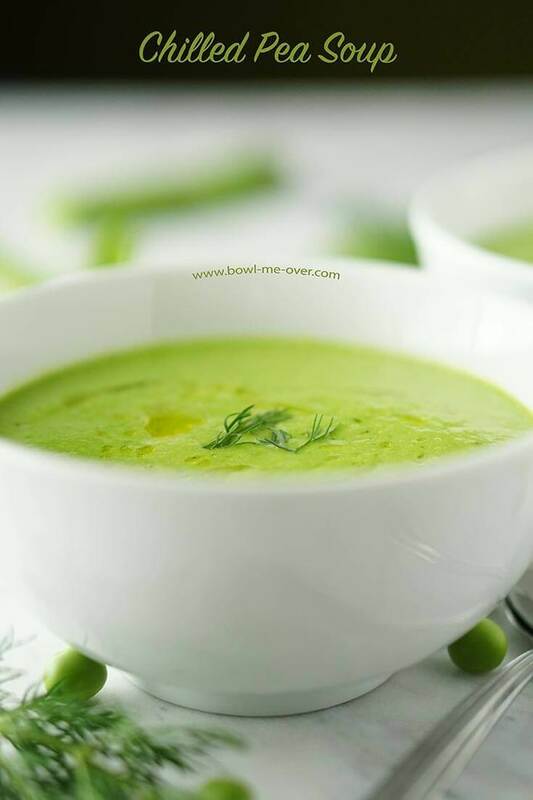 Chilled Pea Soup will fill your mind with images of spring days and warm summer breezes! 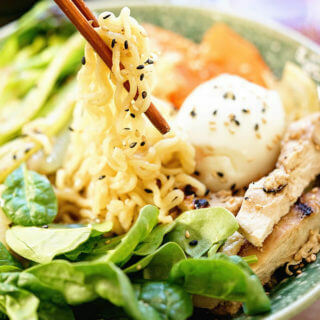 It only takes 15 minutes to make and is full of flavor. It's a beautiful soup and perfect for a bridal shower, mother's day brunch or tea! Next add this mixture to the blender. Add one 10 oz. package of frozen peas and two cups of chicken stock. (I used chicken, but you can just as easily use vegetable stock and it would be vegan). Serve garnished with a drizzle of good olive oil and fresh chopped dill. This post was first shared on Girl in Healing. Love a light delicious soup? Me too – so let me share a few more favorites! Roasted Tomato Vegetable Soup – delicious flavors, everyone will want seconds! 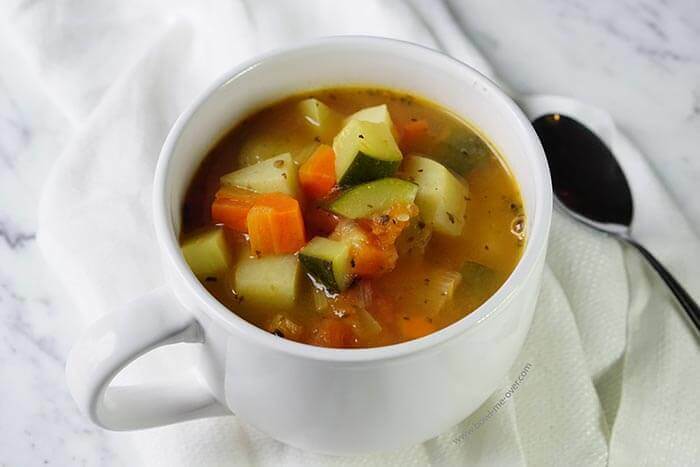 This is a quick 30 minute soup using all kinds of delicious vegetables, YUM!!! 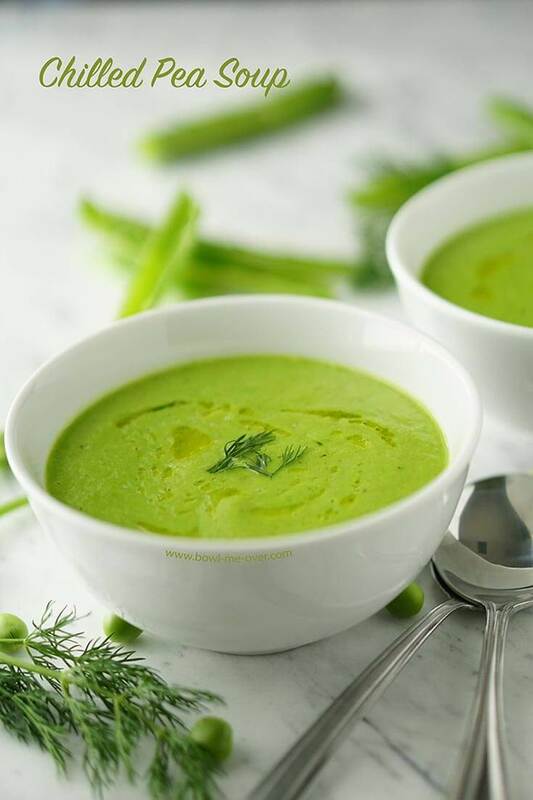 Roasted Asparagus Soup – rich and creamy without the cream! This soup is creamy without the cream – so rich and flavorful. You’ll love this soup! What a perfect spring soup. Thanks Liza! When I made it my hubby said that it was hard to believe so much flavor could be in a soup that’s cold, it’s so delicious, enjoy!! 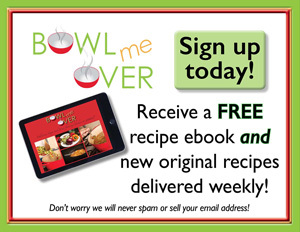 How can you beat a soup that has less than 100 calories per serving? Yummy! Thanks for sharing! Luci’s Morsels | fashion. food. frivolity. You bet Luci, have a fantastic day!! Such a beautiful colour and great flavours too, I love peas and we are in the middle of pea harvest right now so afternoons are spent podding peas, of course only half ever make it to the freezer as the rest end up in my belly. How funny Brian – I have the same issue! Those little peas are BURSTs of yummy flavor and so sweet too. Thank you for stopping by! I’m that person that cooks hot soup on a humid day! 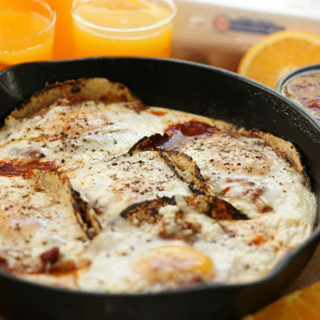 Sometimes, I just have to make my favorite dishes because I’m craving them! I will totally add this cold and refreshing soup to mix things up! You know I am too Jessica – it was 96 here yesterday and I made chicken soup. 🙂 I hope you enjoy this lovely meal! 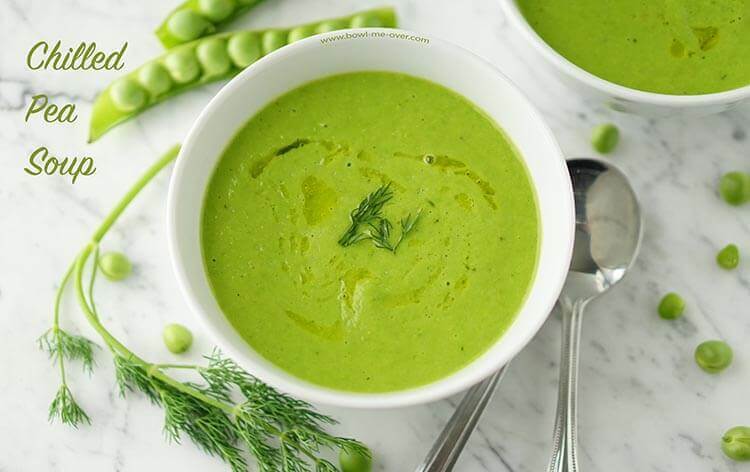 With the hot weather we’ve been having, a chilled pea soup sounds amazing and healthy! Love that it only takes 15 minutes to make too! Yay for simple, flavorful meal – thank you for stopping by Marie! This soup is such a wonderful idea for a spring /summer party. Love the ingredients combo, I’m sure it tastes delicious both cold & warmed up! You’re right Andrea – either way is delicious. 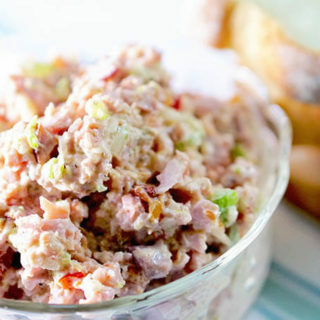 It’s so easy you can whip it up in a snap! No stress with this soup!